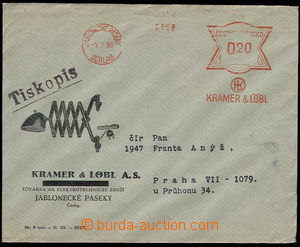 1930 - 38 2 pcs of envelopes with advertising added print and meter stmp, Diablo Separator Prague 16.10.30 and Kramer and Löbl Jablonecké Paseky 2.7.38. Decorative, good condition. 1945-46 2 pcs of letters franked/paid stamp. + OVS(!) after change of rate, 1x Insurance company Slávie Prague 4.3.46, 1x Prague insurance company Prague 10.12.45. Without damage. 1936 Reg and Express letter with mixed franking meter stmp and stamps. Frankotyp PRAGUE 1/ Czechoslovak. benzínová konvence/ 2.10.36 with value 3,60CZK, uprated with stamp 1CZK T. G. Masaryk with CDS Prague 25/ 2.X.36. Express additionally written by hand. Without damage, decorative. 1938 envelope with advertising added print sent as printed matter with reduced postage! meter stmp PRAGUE 1 Ammunition factory Brno/ 4.9.38 with postage stmp value 10h(!!) + additional postmark "lowered postage allowed post. headquarters in Prague ...". Several light stains. Small usage, sought! Decorative. 1942 commercial envelope with Slovak meter stmp Rivnione Adriatica Disicvrta with value 0,30Sk, Bratislava 5.8.42, superb print, fold envelope/-s A5. 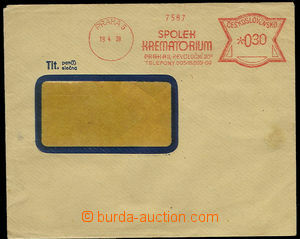 1942 window envelope with Slovak meter stmp TATRA insurance company with value 0,30Ks, Bratislava 4 / 26.11.42. Superb print, light fold envelope/-s.
1944 commercial oblong window envelope with Slovak meter stmp Považská factory on/for rastlinné fats with value 1,30 Koruna, Nové Mesto n./Váhom 4.7.44. Superb. 1945 Bohemian and Moravian (!) 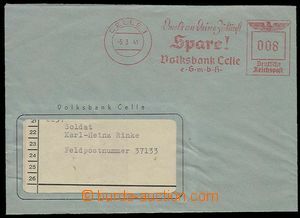 frankotype PLZEŇ LKW/ 18.6.45, sent as Registered, envelope in upper margin torn, RAKOVNÍK Rako/ 25.6.45 window envelope with fold. 1945-53 5 pcs of envelopes with meter stmp, NÁCHOD J.B.&S. / 9.8.45 as Registered letter, PRAGUE AB/ 11.9.45 to Berlin with US censorship, PRAGUE Koospol/ 7.12.49 printed matter abroad, PRAGUE Centrotex/ 8.8.53 to Austria + censorship, meter stmp Prague 1/ 12.VIII.49 by air mail to Switzerland good condition.